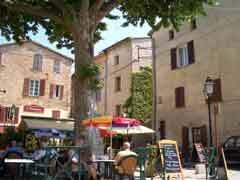 North of St. Tropez, it is next to several restaurants which gives access to the most important facilities of a hotel. This traditional 17th Century house in a Provence village square is tastefully decorated and stylishly furnished in high quality and traditional provençal manner. 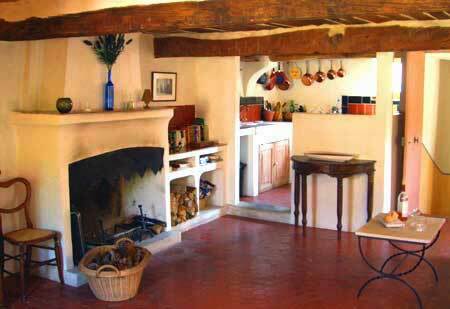 An inexpensive rural Provence gite, it has many of the original features and is furnished with antiques giving it character, atmosphere and a feeling of being a home. 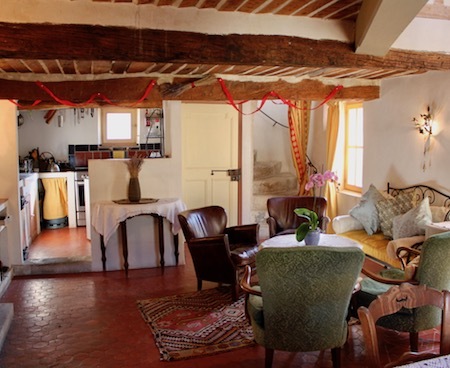 The house has original oak beams, a wood burning fire for romantic evenings, original spiral staircase and a covered terrace with a view of the village and town square. 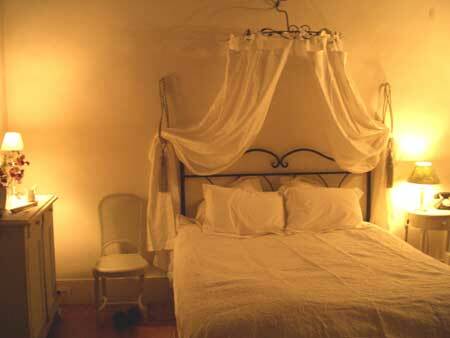 Maison Mimosa - Sleeps 5, two bedrooms, living room, kitchenette, and roof terrace. 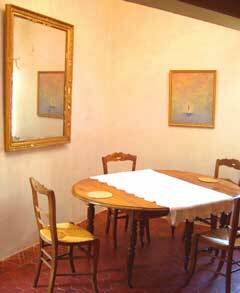 Studio Mimosa - Sleeps 2, one bed studio apartment with on suite shower and toilet. Small kitchen area in main room. 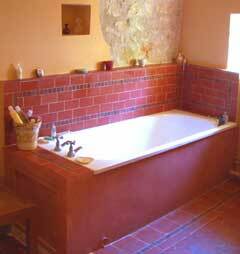 Both - Sleeps 7, The above two combined into one property. 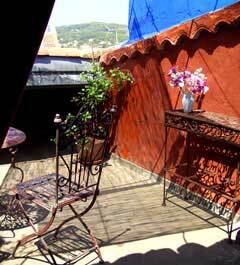 This self-catering house is in the heart of the delightfully sunny Var. The village is lively all year round and has immediate access to local shops and facilities. This gives you all the benefits of a hotel. You have the choice of eating in or eating out at one of the many local restaurants or bars. You can choose from an inexpensive snack to several critically acclaimed restaurants recommended in the Provence-Cote D'Azure Guide Gantié. Coffee is served in the café downstairs from six in the morning. There are over 8 restaurants and bars in the village, 5 of which are less than 300 meters from the house. The nearest supermarket and 3 bakeries are all less than 500 meters away. 300 days of sunshine a year, this area is ideal all year round. With wonderful walks climbing, canoeing golfing and colourful provençal markets. One and a half hours from skiing. The wonderful wines of this area are not to be missed. The Flayosc area is relatively unspoilt with 200k of walks and mountain bike trails. Explore the areas on horse back, on foot or by bike. Even dare-devils will find sports to their taste with such choices as parachute jumping, rafting, abseiling or mountain climbing. A peaceful rural village where provençal style and a good life is every day fare. 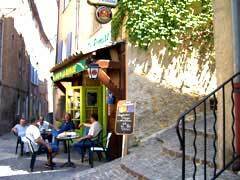 There are many excellent shops and fine restaurants that enable the visitor to experience the provençal way of life. Few villages have such rich and detailed archives as Flayosc including beautiful parchments and irreplaceable documents on domestic and economic life over the centuries. The village’s former thriving shoe-making industry and its 5 workshops, which finally closed down in the 1960's are well documented. Due to its geographical location, Flayosc, which is in the Upper Var region and the Verdon Grand Canyon, does not resemble either the usual Riviera villages, or the nearby, more arid mountain villages. Many of the tourists who come here choose it as their permanent residence, for the tranquillity and quality of life it offers. It is also a very dynamic village, offering a whole range of activities rarely found elsewhere. Here, culture is omnipresent. The Bureau de Tourisme et d'Animation Rurale manages around 30 different clubs and societies totalling 400 members. Flayosc also has its own library and organises street theatre events, concerts and film showings. Summer is the ideal time to enjoy the many traditional celebrations, such as the "Fête de Saint-Laurent" in early August and the Arts & Crafts Fair. Bric-a-brac markets also take place on the 4th Sunday of each month from May to October.